In the last few days, I came across the new GPS sport watch from Bia and became super excited about it. The catch? It's not on the market yet and needs OUR help to get there! The company has set up a campaign through Kickstarter, and it will only be funded if their backers pledge a total of $400K by July 13 at 11:59 pm Pacific. You can back the product by pledging as little as $1. Check out the Bia Kickstarter site and the FAQ for lots of details. Now for the big question - why back this product? I'll tell you why I am and (hopefully) convince you to do the same. I have no ties to the company but love the concept and want it to be successful. Even more, they are based in SF so it's supporting a local company! Design. First and foremost, the watch is designed for both style and function. 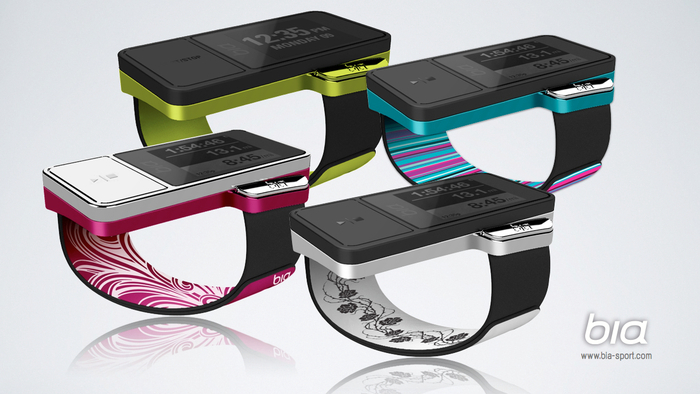 It's smaller than other GPS devices, will come in fun colors, and has different size bands for arm size (like men vs. women.) Even more, the neoprene band is completely adjustable to guarantee comfort. The watch is rectangular and fits so it's slanted on your wrist, missing the wrist bone and making it easier to read when being active. Photo from Bia Kickstarter site. Note how it fits the wrist. Photo from Bia Kickstarter site. Look at the color options! I'm craving the teal one. Function. Bia has a large display to make it easy to see, and it has only one button plus the touch screen to keep it simple. You shake it to light up the backlight (I love that.) 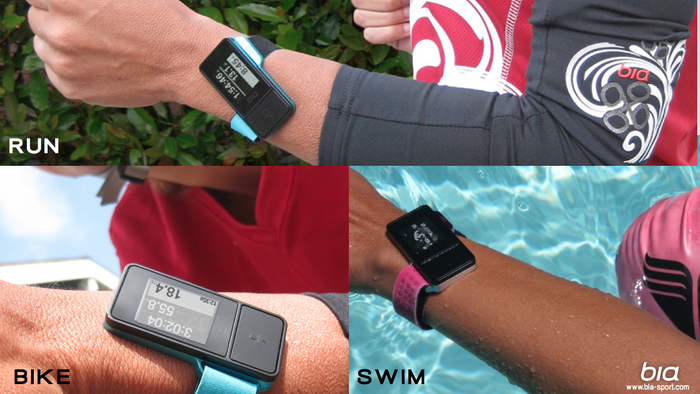 It is water resistant to 100M, so you can swim in it, and Bia GPS even tracks distance while swimming. The GPS is quick connect, meaning you don't have to wait to find satellites (i.e. no standing on the sidewalk looking like a weirdo staring at your watch forever...we've all been there.) The sport watch itself runs on a normal watch battery so it doesn't need charged all of the time, and the coordinating GPS Go stick only gets charged every 17 hours of use. You can buy the sport watch with or without the GPS Go stick depending on your needs. Safety. Now for one of the most important parts - Bia has a safety alert that will contact someone in your time of need. This is huge. I hate running with my phone and avoid it almost always (unless I think I might get lost in a new place,) but I've wondered what I would do before if I needed help when alone on a run. This is a great answer to that question! Bia is targeting production for consumers in April 2013 if they get the necessary funding. For now, you can go to the Kickstarter site and pledge as little as $1 to back the product. Every little bit helps! The pledge itself is charged through Amazon, and you only get charged if they meet the goal by July 13. Personally, I went for the early bird special award level because I'm targeting that teal design. If you like it, help Bia out and share their idea on Facebook, Twitter, DailyMile, or with your sport groups. Let's get this thing to market! I saw that on the fitfluential page the other day... I pledged a little. I am curious about it! Have a great race tomorrow!!! Crossing my fingers this happens.